The Terrier hockey schedule for 2008-09 will feature 20 home dates, three in-season tournaments and a rugged non-conference slate. A week after an October 5 exhibition game against Univeristy of New Brunswick, BU hosts the IceBreaker, meeting Michigan State the first night and North Dakota the second. UMass completes the field. Michigan visits Agganis Arena on Oct. 25. Second semester begins with the Wells Fargo Denver Cup on Jan 2 & 3, with BU facing RPI in the opener and either Denver or Holy Cross the second night. In February, BU looks to reclaim the Beanpot championship, beginning with a first round matchup against Harvard. Corey Trivino, who will join Colin Wilson at the NHL draft combine in Toronto next week, looks back on his experience with Canada's gold-medal-winning World U18 team. College Hockey News reports that recent BU Hall of Fame inductee Shawn McEachern has been named the chief recruiter for UMass-Lowell, replacing another former Terrier, Ken Rausch. The Stanley Cup finals begin today and Penguins defenseman Ryan Whitney discusses his hopes to become the seventh Terrier to have his name inscribed on the trophy. The previous six: Jay Pandolfo (twice), Scott Young (twice), Chris Drury, Joe DiPenta, Ed Ronan and Shawn McEachern. Next Monday, Colin Wilson, now ranked number 8 for the upcoming NHL draft by International Scouting Services, heads to the annual NHL Draft Combine in Toronto for for testing and interviews with NHL scouts and personnel directors. UNH’s James Van Riemsdyk, last year’s #2 draft choice and Wilson's teammate on the NTDP U18s, offered some thoughts about his former linemate, as well as other top prospects, for the NHL’s 2008 Entry Draft Blog. career, Colin is the one guy that I would consider almost a guarantee to play in the NHL just because of how he is. He works so hard and is very talented and I would definitely say he will someday have a successful NHL career. Corey Trivino — Exposure at the world U-18s was great for him as he stepped up his game playing with skilled linemates. Was consistently dangerous and cashed in chances around net. We begin looking at BU’s 2008 recruit class by updating the Kieran Millan profile posted in February. Millan (video interview-click on This Week in the AJHL-Dec. 14) spent the past two seasons with the Spruce Grove Saints. The Edmonton native had a standout rookie season, posting a 2.61 GAA and a .919 save percentage and being named to the AJHL South Division all-rookie team. Shortly after being selected for the league’s 2007 all-star game, he committed to BU for 2008. Millan’s second AJHL season got off to a slow start largely thanks to an injury and aided by an inexperienced Saints roster. By season’s end his stats were a respectable 3.04 and .904 and he went into the playoffs playing his best hockey of the season. Millan led the Saints to a sweep of Lloydminster and a seven-game win over a Grand Prairie team the Saints had failed to beat once in the regular season. The playoff run ended against powerhouse Ft. McMurray, but Millan’s post-season numbers were a shiny 2.19 and .923.
matters the most. Our three-round play-off run this spring showed the evolution he has undertaken over the past two seasons with our club. He gave us a chance to win every night...I mean that literally. great relationship and I give Kieran a ton of credit for opening himself up to the idea of progressive change and improvement. He had some early season struggles..which I think ultimately served as a tremendous catalyst for the growth he has shown. Kieran has a very calm demeanour to balance his aggressive goaltending style. He will challenge shooters and force them beat him rather than wait for the puck to overwhelm him. His lateral mobility and skating is second to none at any level. He has the tools to be a dominant Division One goaltender for the Terriers. I wish him the greatest success. Kieran's main strength is his play recognition. He's able to read what is about to happen and make the correct move when required, most often in time. He has quick feet and covers the net from side-to-side extremely well and his glove hand is fast. If he has one weakness, it's perhaps his penchant to go down too quickly at times on shots, leaving the top of the net empty. Since he's not an overly big goalie, dropping too fast can cause problems but he more than makes up for that with his other skills. As for him handling the puck outside of the crease, in all honesty he's better off letting the defence play it instead, but given some time to work on that part of the game I'm sure he can improve. Prior to Spruce Grove, the 5-11 Millan played AAA Midget for the Edmonton Gregg Distributors, and was named top goalie in Western Canada’s 2005 Ice Mania Tournament. Two former winners of BU’s George V. Brown Award for Most Valuable Player were inducted into the BU Athletics Hall of Fame this past Sunday. 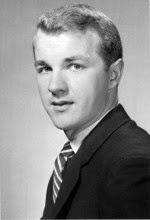 Larry Davenport (photo) was co-MVP in 1969-70, and Shawn McEachern was MVP in 1990-91. An upcoming blog post will look back at the careers of these two high-scoring Terrier centermen. 2008 recruit Chris Connolly finished his season with an on-ice celebration as Omaha beat Waterloo 4-3 in overtime to win the USHL’s Clark Cup Championship. Connolly finished the regular season as the Lancers second leading scorer with 55 points and led the team in goals with 26. He added eight points during Omaha’s playoff run. In 59 regular season games, Connolly totaled just 17 penalty minutes, with 9 coming in the season opener back in September. The last Terrier recruit to play for a Clark Cup champion? 2007-08 Terrier captain and MVP Pete MacArthur, then playing for Waterloo, along with a trio that head to UNH: Kevin Regan, Matt Fornataro and Mike Radja. John Curry posted his first AHL playoff shut out on as Wilkes Barre-Scranton blanked Portland 2-0 Wednesday night in the first game of the AHL Eastern Conference finals. Curry stopped 19 shots. Game two will be played tonight. Ryan Whitney’s second career playoff goal (video) put the Pittsburgh Penguins on the board first in Tuesday’s game 3 of the AHL Eastern Conference finals. The Pens, now 11-1 in the playoffs, beat Philadelphia 4-1 and are just one win from the Stanley Cup finals. Game four will be played tonight. Coach Jack Parker announced yesterday that sophomore goalie Brett Bennett will not return to the Terrier hockey team for the 2008-09 season. In the brief announcement, Parker said, “Our staff has decided that we move in a different direction in regards to our goaltending. We wish Brett the best in his future endeavors.” There was no indication of Bennett's immediate plans. He appeared in 31 games for BU in 2007-08, making 29 starts. He posted an .888 save percentage and a 2.63 goals against average along with a 16-10-3 record. The Daily Free Press issued a news brief on this developement. BU will begin next season with three goalies. The sole returnee is sophomore-to-be Adam Kraus, who made two starts in 2007-2008, including a win the Beanpot Consolation game, and posted a 4.04 goals against average. A pair of highly regarded recruits, Grant Rollheiser of the Trail Smoke Eaters (BCHL) and Kieran Millan of the Spruce Grove Saints (AJHL), will compete for the vacant starting spot. This is a familiar position for Rollheiser. When he joined Nelson in the 06-07 hockey season it was as part of a tandem in goal. Rollheiser worked all season to win the confidence of Coach Simon Wheeldon, and he was given the starting job for a playoff run all the way to the KIJHL finals. When he joined the Trail Smoke Eaters in the 07-08 hockey season it was as part of a tandem in goal with Paul Barclay. Rollheiser struggled with confidence early, but he found his game and won the confidence of Coach Jim Ingram. Within a month or so Rollheiser took over the starting job and ran with it all the way to a fantastic finish and scholarship to BU. This whole scenario has got to feel like deja vu to Rollie. Three seasons in a row he jumps to a new level of hockey with another rookie goaltender battling for the starter's job. Each time he started a bit slow as he got used to the level of play, and each time he won the starters job and played at an elite level in the second half. We know the jump from Junior A to Division 1 is a huge leap, but I expect Rollheiser will establish himself as the starting [goalie] for the Terriers at the very least by Christmas this year. I also expect he'll be doing that after getting his name called by an NHL team this June at the draft in Ottawa. What a crazy three years it's been for the young goaltender. Shawn Mullin, who also handles radio play-by-play for Trail, will share further information about Rollheiser in the weeks preceeding the June NHL draft. We're also seeking an informed analysis of Millan who was named the AJHL Northern Division All-Rookie goalie in 2006-07. He led Spruce Grove to an impressive, upset-filled playoff run this past spring, posting a 2.19 GA and 923. save percentage. Matt Gilroy, invited to participate in the U.S. National team training camp last week, didn’t make the final roster, but two former Terriers are taking part in the IIHF World Championships in Quebec and Halifax City. Winger Frantisek Skladany (#20 in photo) who spent the past two seasons in the Czech Pro League, is skating for his native Slovakia and had an assist in Saturday’s win against Norway. Defenseman Jakabs Redlihs is representing Latvia. The Riga native, who began this past season with Syracuse (AHL) and finished in the Czech Pro League, is joined on the Latvian roster by his brothers Krisjanis and Mikelis. A few weeks ago, we had reported Gilroy's unexpected decision to return to BU for his senior season. A recent news feature in The Daily Free Press looks at several reasons Gilroy's choice, including loyalty to the university, a desire to complete his undergraduate degree, the opportunity to play with his brother, incoming freshman Kevin, and a stronger free-agent position next summer than he'd have now. Chris Drury and Mike Grier, teammates at BU and later on the Buffalo Sabres both were eliminated from Stanley Cup play Sunday in overtime games, leaving Pittsburgh’s Ryan Whitney as BU’s only remaining NHL playoff performer. Grier and the San Jose Sharks lost to Dallas, 2-1 in a four-overtime game. Drury’s New York Rangers, had avoided a sweep by Pittsburgh, winning game four, but after battling back yesterday from a 2-0 deficit, lost 3-2 in overtime. The Penguins take on Philadelphia in the Eastern Conference final. John Curry is the only Terrier still playing in the AHL Calder Cup playoffs. Curry’s Wilkes-Barre/Scranton Pens evened their division final series with Philadelphia at one apiece Saturday night with a 5-4 win. Tonight, Kevin Schaeffer and the Reading Royals play a seventh game against Cincinnati in the ECHL Northern Division finals. Schaeffer had played 31 games with AHL Providence before being returned to Reading last month. Incoming freshman Chris Connolly (Omaha Lancers) is in the finals for the USHL Clarke Cup. The Lancers lost game one to Waterloo.